I think I was inspired mostly by Angelica! I have a soft spot for this imaginative girl! Also, we have a wonderful Ecomuseum Zoo just outside of Montreal. I love to visit that place! Now they don’t have lions, but I imagined a place where there might be a rescued lion. The best surprise for me in writing this book was Angelica’s wild imagination. There’s a part in the story where Angelica makes up a story about traveling by airplane with Mwezi. It honestly felt like Angelica was making up the story — not me. And Angelica made me laugh out loud during that part!! Maybe the real life Angelica who inspired my first Angelica book, Princess Angelica, Camp Catastrophe. I met that Angelica during a school visit to Lindsay Place High School in Montreal. The first Angelica book is dedicated to her. Have you used your imagination lately? Have you told yourself a story that made you laugh out lloud? (I hope so!!) Also, on a more serious note: can making up stories get us into trouble? What is the connection between story-telling and lying? (That’s a very grown up question, you know.) As a fiction writer, I am paid to make stories up. I also work as a journalist — and when I write newspaper stories, I would be fired for making things up! Hey, in the third Angelica book, Angelica is going to pretend to be a newspaper reporter! Shh, don’t tell. That book won’t be published until 2020. Conversations about the power and importance of imagination. Conversations about the magic healing power of humor. And conversations about the dangers of making stories up! 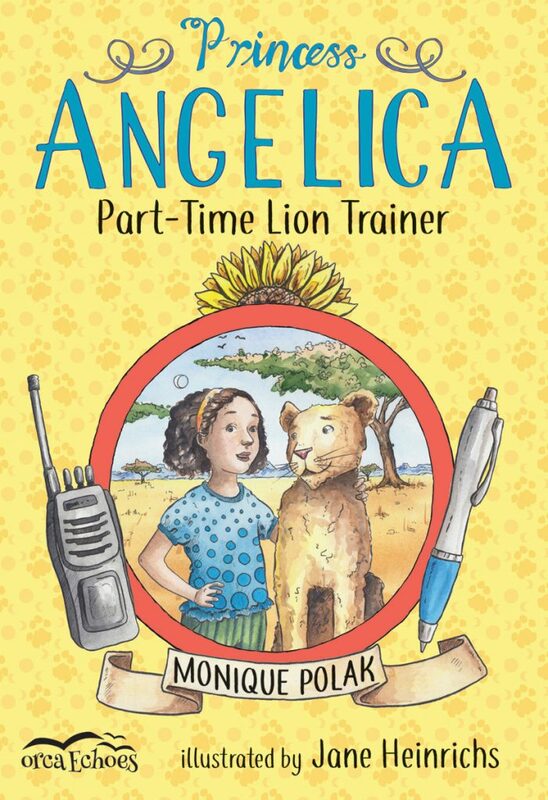 Princess Angelica, Part-Time Lion Trainer is available now! Monique Polak is the author of over twenty novels for kids and young adults. She has also written two nonfiction books for kids as well as a board book for toddlers. Monique teaches English literature, creative writing and humanities at Marianopolis College in Montreal.